1. From Admin, click Company Cars. 2. Click the New Vehicle button. 3. Select the user that you wish to assign to the vehicle from the dropdown. 4. Choose how the user pays for the fuel. You have the option of choosing either Company/fuel card or Out of pocket. You have the option to add in the registration of the car. 6. 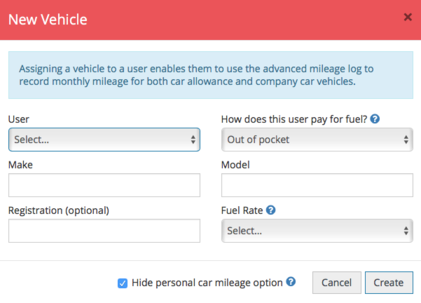 Select a fuel rate from the dropdown. If the fuel rate you wish to use is not in the list you can add your own. 7. You can decide to hide the personal car mileage option on that user's account. Once you're happy, click Create to add that vehicle to your account. Your users will now be able to see their vehicles in their Overview area. 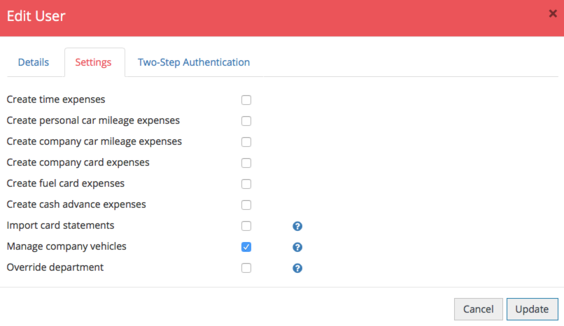 If you would like your users to manage their own vehicles, you should navigate to the user's profile, Edit their settings and ensure that Manage company vehicles is ticked.